The United Kingdom - as well as almost every other country on the planet - has often suffered from the effects of environmental damage through the proliferation of non-native species. For millennia, mankind has traveled the world, followed quickly by the establishment of trade routes and the movement of valuable animal and plant commodities. Unfortunately these routes have also brought their fair share of problems such as the globalization of smallpox, influenza and the infamous ‘black death’. Today similar problems exist and while modern medicine has made great strides in the prevention of such epidemics there is still an on-going problem with the deliberate and accidental introduction of non-native plant and animal species into sensitive environments. Recent history has already shown us the terrible destruction that can be reaped through the experiences of Hawaii, Australia and New Zealand. Invasive non-native plant and animal species are now the second greatest threat to biodiversity worldwide after habitat destruction. This is because they can have a negative impact on native species, as well as for the damage caused to the environment, and as a secondary issue - local economies. One of the most devastating introductions to the United Kingdom in recent years is the American Signal Crayfish. Originally the Signal crayfish was commercially bred in this country for the restaurant trade but about 25 years ago a handful managed to find their way into the waterways across England and Wales. Today, populations of Signal crayfish can be found as far south as Cornwall and are now making their way up into areas of Scotland causing devastation among our native populations of the smaller and less aggressive white-clawed crayfish. Not just confined to the water, Signal crayfish also have a habit of walking overland in a search for new feeding and breeding ‘grounds’ which is why they have been able to colonize such large areas of the country so quickly. It is a voracious predator and extremely damaging to sensitive environments as it will eat almost anything it finds including plants, other invertebrates, snails, small fish and fish eggs. It is also cannibalistic and quite happy to make a meal of its own young. The Signal crayfish also digs burrows up to three feet long into river banks where each year a single female can lay more than 250 eggs at a time. At a time of increased flooding risk, areas where there are significant numbers of Signal crayfish have seen their once stable river banks collapse. As you would expect, populations of our native white-clawed crayfish are now severely under threat. The American species of crayfish is bigger, more aggressive and easily out-competes our native species. 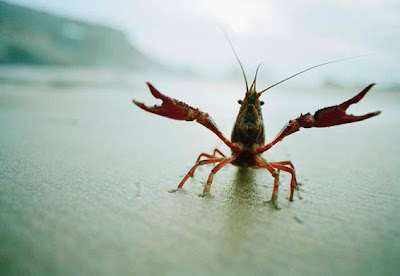 Perhaps worst still they also carry a virulent disease, known as ‘crayfish plague’ – a water borne fungal infection, which can spread rapidly among more vulnerable native species. 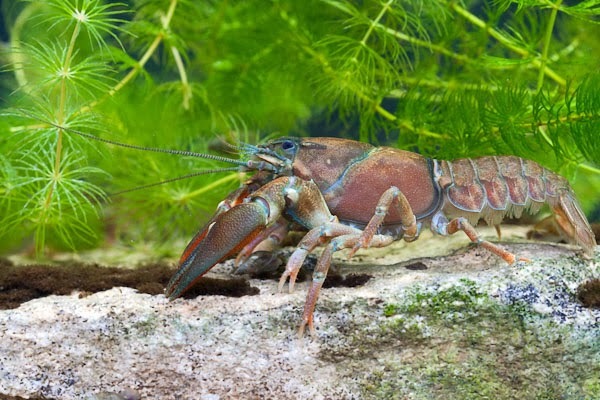 Unfortunately while the Signal crayfish is resistant to the disease it can still act as a carrier, and now the crayfish plague believed to have been responsible for wiping out our native crayfish from most of the rivers in the south of England. Environmentalists say that the current northern stronghold of native white-clawed crayfish in the Scottish rivers of Wansbeck and Aln could also be under threat. In response to this, the Scottish government financed a pilot scheme at Loch Ken in Dumfries and Galloway amid fears that the Signal crayfish could cause havoc if they reach the salmon stretches of the River Dee. In the process they managed to catch and destroyed more than a million Signal crayfish – a startling figure and hopefully the wake-up call needed to bring the highly destructive Signal crayfish to wider attention. JELLY FISH SWARMS – THE LATEST MAN MADE DISASTER? WHICH COMPOST DO YOU NEED FOR VENUS FLYTRAPS?